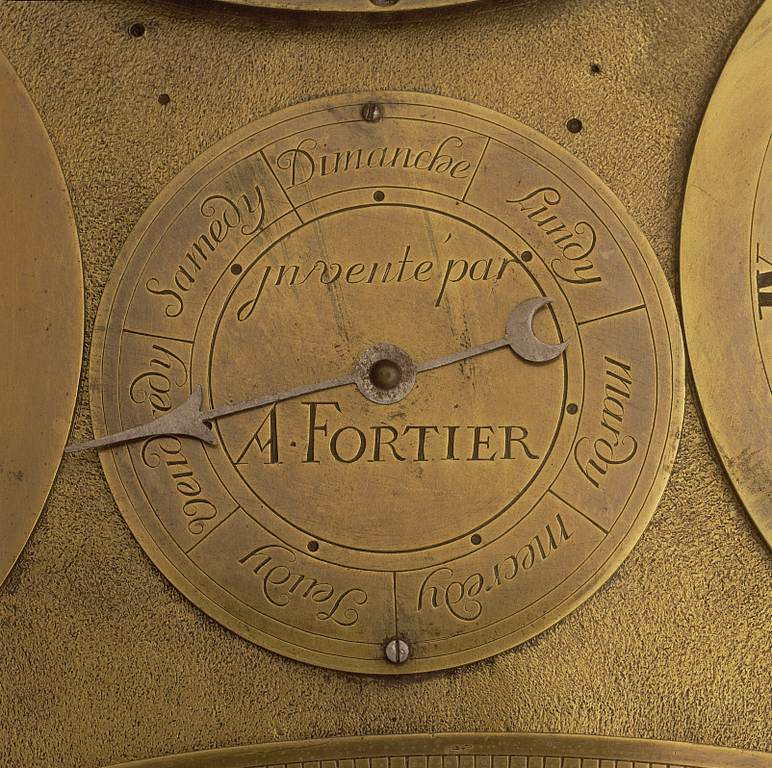 Dial engraved "Inventé par A. FORTIER". 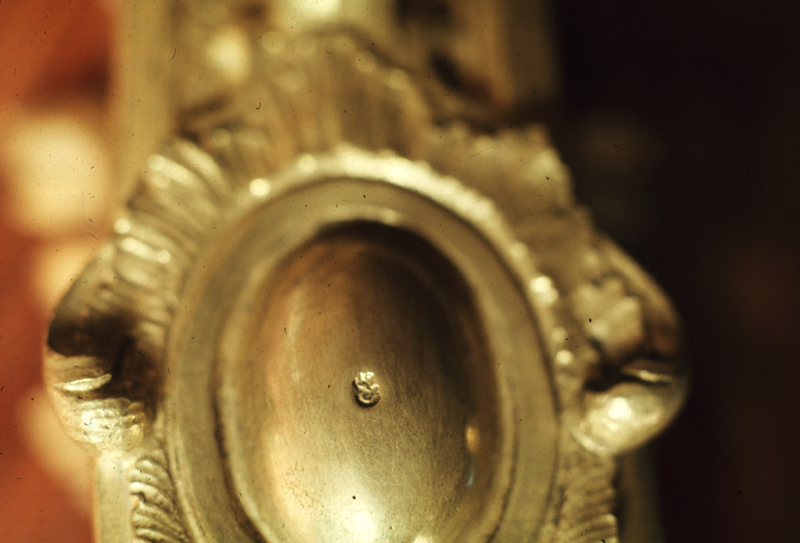 Markings: Mounts of lower sections stamped with the crowned "C" for 1745-1749. 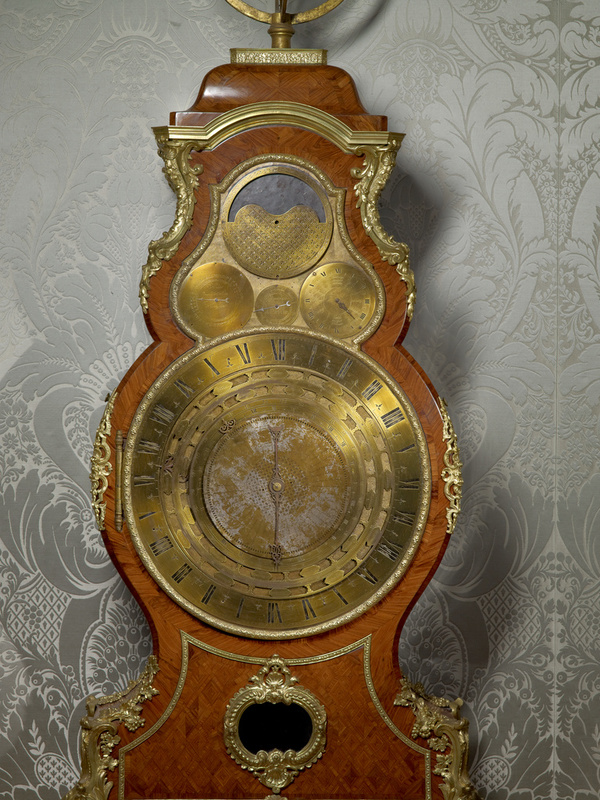 This elaborate timepiece demonstrates the level of astronomical knowledge of eighteenth-century French scientists. 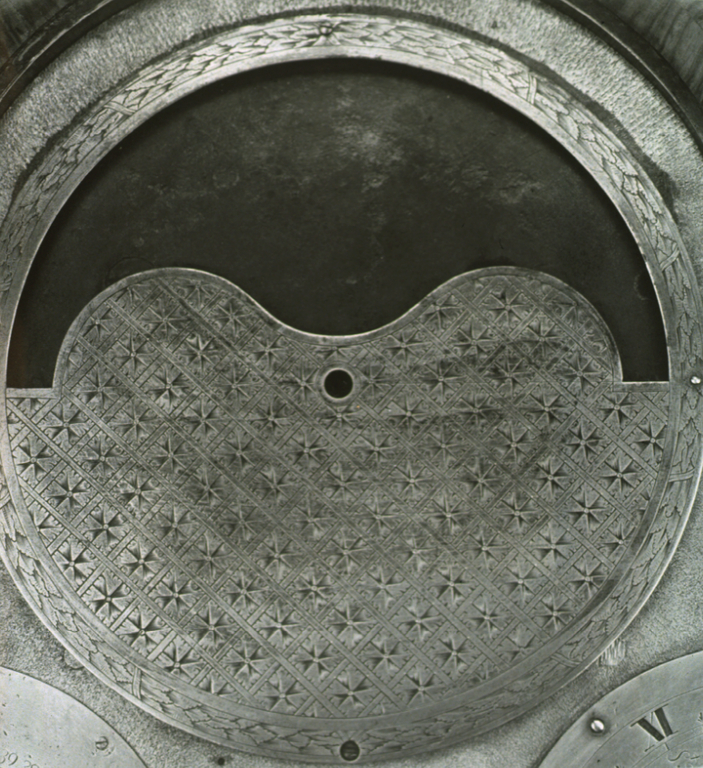 The large main dial is composed of overlapping circular plates and three hands that indicate the time with a twenty-four hour chapter ring, the months of the year and their zodiacal signs, the days of the lunar month, and the local time in various cities and parts of the world, including La Californie. 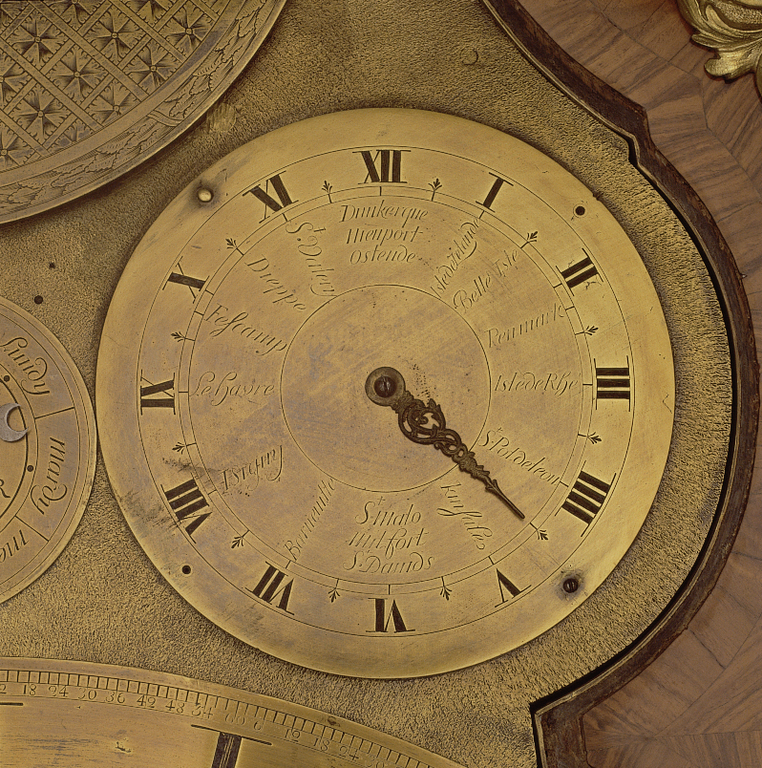 The four smaller dials grouped above show the phases of the moon, a tidal calendar for the ports of Northern France, the days of the week, and the times of the eclipses of Jupiter's first moon, Io. 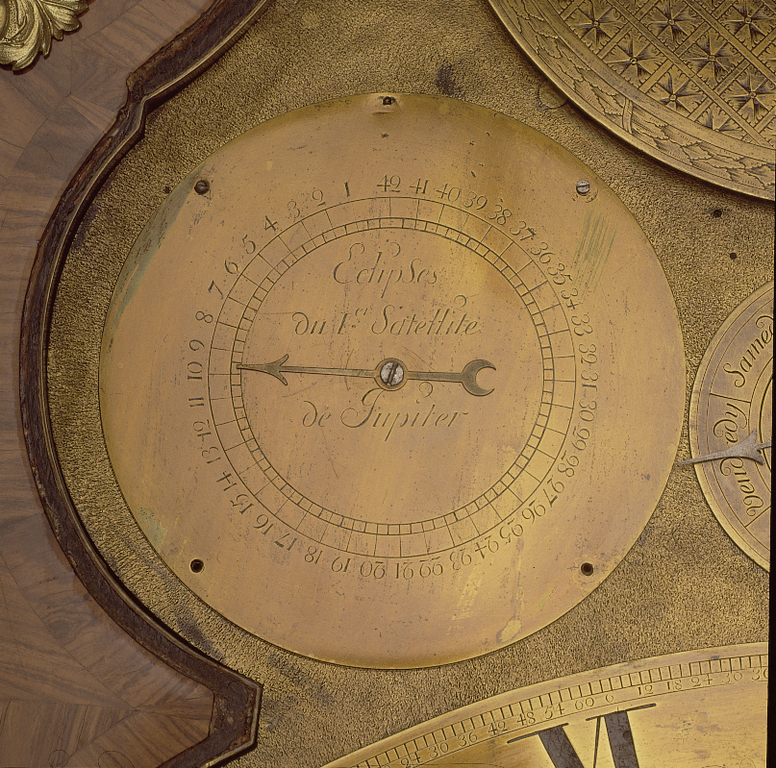 On the top of the case, a gilt-wood orrery shows the relative positions and motions of bodies in the solar system. 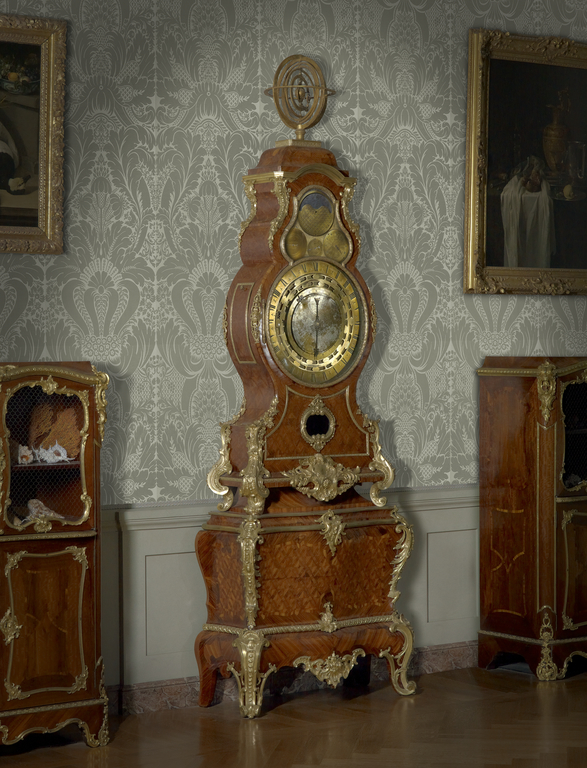 Very few such elaborate clocks have survived to the present. Unfortunately this clock is no longer in working condition as the movement is entirely missing. "The Grand Gallery." Connoisseur (October 1974), p. 122. Wilson, Gillian. "The J. Paul Getty Museum: 6ème partie: Les Meubles Baroques." Connaissance des Arts 279 (May 1975), p. 110. Hunter, Penelope, and Gerald G. Stiebel, eds. The Grand Gallery at the Metropolitan Museum of Art: Sixth International Exhibition (New York: Metropolitan Museum of Art, with Hennage Creative Printers, 1975), p. 50, no. 44. Miller, Carole Ann Lyons. "Clockwise Special Report: The J. Paul Getty Museum." Clockwise (August 1979), pp. 15-21, fig. 7. Wilson, Gillian. Selections from the Decorative Arts in the J. Paul Getty Museum (Malibu: J. Paul Getty Museum, 1983), pp. 36-37, no. 18. Sassoon, Adrian, and Gillian Wilson. Decorative Arts: A Handbook of the Collections of the J. Paul Getty Museum (Malibu: J. Paul Getty Museum, 1986), p. 40, no. 86. Verlet, Pierre. Les Bronzes dorés français du XVIIIe siècle (Paris: Picard Éditeur, 1987), p. 115, fig. 144. Bremer-David, Charissa, et al. Decorative Arts: An Illustrated Summary Catalogue of the Collections of the J. Paul Getty Museum (Malibu: J. Paul Getty Museum, 1993), pp. 88-89, no. 138. Wilson, Gillian, et al. 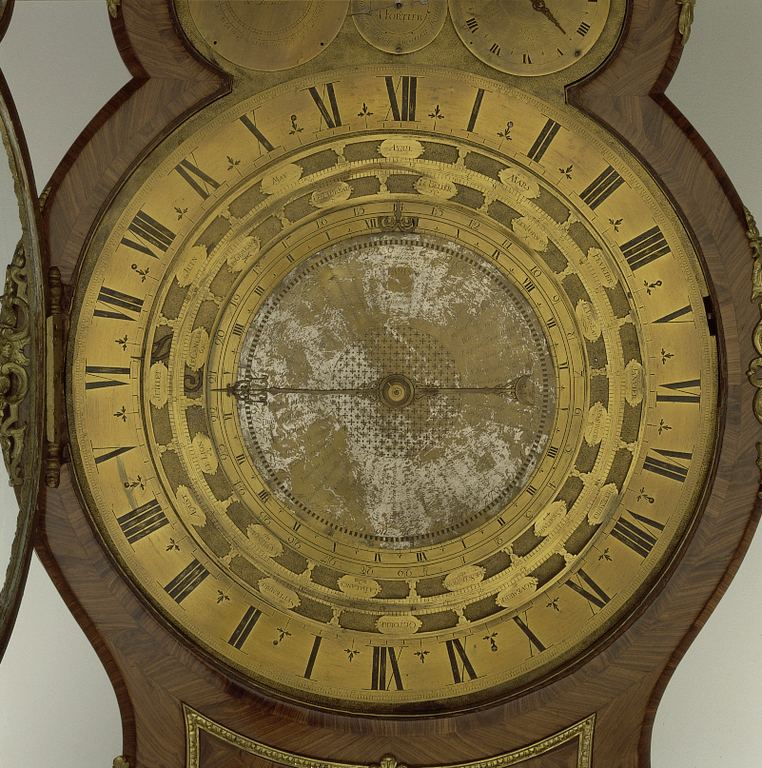 European Clocks in the J. Paul Getty Museum (Los Angeles: J. Paul Getty Museum, 1996), pp. 92-101, no. 13. Augarde, Jean-Dominique. Les Ouvriers du Temps, La Pendule à Paris de Louis XIV à Napoléon Ier (Geneva: Antiquorum Editions, 1996), pp. 228-29, pl. 182. Bremer-David, Charissa, ed. Paris: Life & Luxury in the Eighteenth Century, exh. cat. (Los Angeles: The J. Paul Getty Museum, 2011), pp. 20-21, fig. 10, p. 33 (detail), p. 119, no. 19.